State and local demand for education services has surged over the most recent year, making work in K-12 schools one of the fastest-growing areas in government contracting. That’s one of the main findings from an analysis of bids and requests for proposals completed by Onvia, a company that studies and provides information on public procurement. The findings were presented at a conference in Washington, D.C., this week. The number of bids and RFPs for educational services at the state and local level has risen by 20 percent, from 2,623 to 3,160 from 2015 to 2016, according to Onvia. 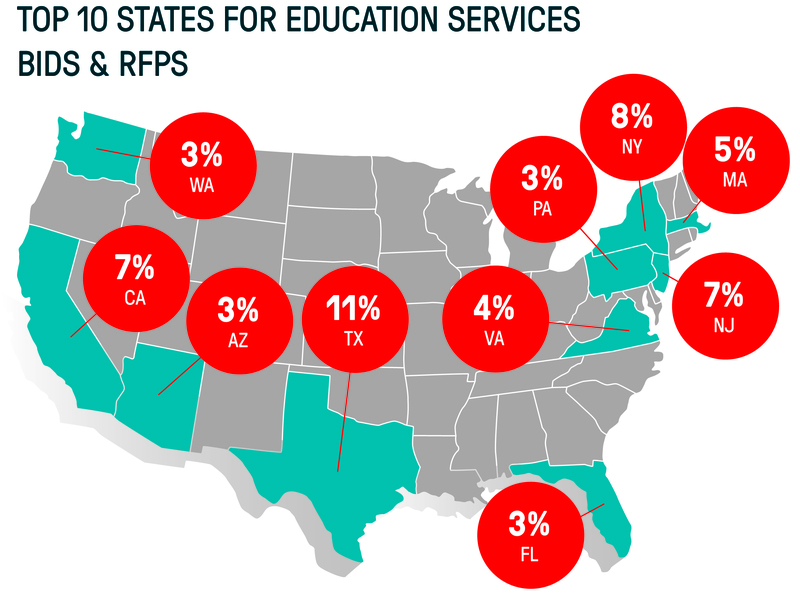 Individual states’ share of the education-focused bids and RFPs issued nationwide can be seen in the map below. Texas, New York, and California are the biggest players, which is not surprising given the size of those markets. Onvia, a Seattle-based company, says demands from state agencies, local school districts, and other entities have been “heavily influenced” recently by factors such as growing demand for ed-tech and training, a continued focus on STEM subjects, and evolving curriculum and performance-measurement standards. Onvia categorizes “educational services” to include a wide variety of school needs, including student testing, consulting, extracurricular activities, educational recruitment, driver’s ed, continuing education, and counseling. The dominant government entities putting out bids and RFPs in education are state departments of education and school districts, though other entities such as individual schools are also in the mix, Onvia says. Onvia officials presented the data at an Oct. 5 event held in the nation’s capital, where the company’s analysts talked with businesses about opportunities in the public sector. Onvia’s report also places state and local spending on education in the broader context of government procurement. The company says the overall market for government spending on products and services in the United States stands at about $2 trillion, with $1.5 trillion occurring at the state and local, as opposed to the federal level. Roughly 450,000 bids and RFPs are issued per year, Onvia says. Other fast-growing areas of government procurement at the state and local level include demand for improved medical equipment; improved connectivity in areas such as fiber-optic cabling and building-specific projects; disaster response, most likely a result of state and local responses to hurricanes and flooding; upgrades to “smart” or energy-efficient lighting; and preparing sites for construction. Onvia says its above-referenced estimates in the report of bids and RFPs related to connectivity do not include money spent on the federal E-rate program, though Onvia analyzes procurement in that sector, too. The Federal Communications Commission over the past few years has restructured the E-rate, which supports school and library connectivity, and provided it with billions in new public funding. Another fast-growing area of demand in contracting identified by Onvia’s report is for school bus services. Many districts are moving to outsource public bus services to private contractors, a change that appears to be partly driving the growth of bids and RFPs in busing by 10 percent from 2015 to 2016, Onvia says. New York and New Jersey have both been especially active in bus-focused projects. Windows file explorer is the very important application of the windows operating system and this is reason http://fileexplorerwindows.com the improved performance and web compatibility and a better experience for multilingual users as also being among the updates.